Democratic leaders say they will return week of Dec. 8 if companies can show they have a 'viable' turnaround plan. NEW YORK (CNNMoney.com) -- With the prospects of an auto bailout this week all but dead, Democratic leaders said Thursday that Congress would return in December to consider extending a $25 billion lifeline for troubled U.S. automakers if the companies devise a "viable" recovery plan. "Democrats are determined to help auto workers and the auto industry," said Senate Majority Leader Harry Reid, D-Nev. "Unfortunately, the sad reality is that no one has come up with a plan that can pass the House and Senate and get signed by President Bush." The news comes two days after acrimonious hearings on Capitol Hill in which the CEOs of General Motors (GM, Fortune 500), Ford (F, Fortune 500) and Chrysler said they needed an immediate $25 billion bridge loan to stay afloat through the end of the year. The Bush administration, as well as many Republican and Democratic lawmakers, have pushed back. Opponents of an auto bailout argue that GM or any other automaker that can't sustain itself should use bankruptcy protection to to become competitive, rather than depend on federal assistance. Lawmakers said that the auto companies have to prove that they would put bailout money to good use - so they wouldn't come back asking for more in the future. "It is all about accountability and viability," said House Speaker Nancy Pelosi, D-Calif. "We [need to] see a plan where the auto industry is held accountable. Until they show us the plan, we cannot show them the money." 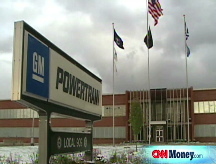 Executives at General Motors and Ford insist that bankruptcy is not an option. GM CEO Rich Wagner said he doesn't think consumers would buy from bankrupt automakers. Chrysler CEO Robert Nardelli said this week that his company also wants to avoid filing, arguing that buyers would demand cash on delivery and cause an even greater cash crunch. All three companies are burning through cash at a dangerous rate. Many economists and auto industry analysts say a bankruptcy, even one that allowed one of the companies to reorganize its business and shed expensive labor contracts, could pose serious risk to the economy. Jobs would be lost and factories shut. "We reject those advocating bankruptcy for the industry, but I don't think we saw very much in the hearings of the last few days that gave us the confidence that we can act upon it legislatively," Pelosi said. Following the announcement by Reid and Pelosi, a group of senators said they had reached a compromise agreement to provide a $25 billion bridge loan to the auto industry. The senators - Michigan Democrats Carl Levin and Deborah Stabenow, Missouri Republican Kit Bond, Ohio Republican George Voinovich and Democrat Sherrod Brown, and Pennsylvania Republican Arlen Specter - had hoped to move quickly on their plan. But it was clear that their bill would not be put up for a vote anytime soon. "Obviously, we're disappointed that we're not going to act today," Levin said. "We believe there is at least a reasonable chance that this proposal of ours, if it were put to a vote today, it could get to the 60 votes needed to pass." The bipartisan group from key auto manufacturing states said their bill could pass because the loan would come from the Energy Independence and Security Act passed in 2007, not the Treasury's $700 billion financial rescue plan that Bush and many Republicans oppose tapping. "We cannot allow the issue of which source of already appropriated funds will be used for the essential purpose of preventing this economy from sliding into a depression," Levin said. "We cannot allow that issue to prevent us from doing what needs to be done, which is to provide these loans promptly to the domestic automobile industry." Voinovich said the compromise bill would pass through Congress because it sets up provisions that would require automakers to account for their government loan. It would create a vehicle in which companies can submit a plan for viability, and will only receive a loan if the plan is approved by lawmakers. "We're asking for a plan that will guarantee viability for the companies and will guarantee the loan will be paid back," he said. "I'm disappointed we're not going to get this done today. This would have been a wonderful Thanksgiving present for millions of Americans." Reid and Pelosi asked the Big Three to submit plans by Dec. 2 that will spell out how they will use the loan in order to become financially stable in the future. Congress will reconvene on Dec. 8 in another lame duck session to vote on the matter. The automakers said they would comply with the Democrats' request, cheering the chance to state their case again. "Ford welcomes the opportunity to provide our plan to Congress," the company said in a statement. "We have a great plan that will continue Ford's transformation into a lean, profitable company that delivers the safe, fuel-efficient, high-quality new products that our customers want and value." Similarly, General Motors said it would be able to show Congress that it had a viable plan. "We will continue to work vigorously with the Congress and the administration during the next few weeks to address their concerns," the company said in a statement. Chrysler said it is prepared to meet the "accountability and viability" criteria laid out by Congress, and is ready to provide its plans for returning Chrysler to profitability. "Chrysler is changing and will continue to change," the company said in a statement. What remains to be seen is what any final bailout measure would look like. The Senate could adopt much of the compromise bill, which the Bush administration Thursday said it would support. "While we need to review the language, this is an agreement the president could support," said Dana Perino, White House press secretary. "We encourage the Congress to pass it as soon as possible."